Medium-term Business Plan - HANWA Co., LTD.
For the next decade, this business plan has the objectives of steady growth of Hanwa by earning profits in current business domains while achieving speedy earnings growth driven by group companies and strategic investments. In addition, there will be more strategic mergers, acquisitions and alliances to add more future sources of earnings. The basic concept for Hanwa's human resources and organization is "Professional & Global"e;. We are clearly stating our position that puts customers first. 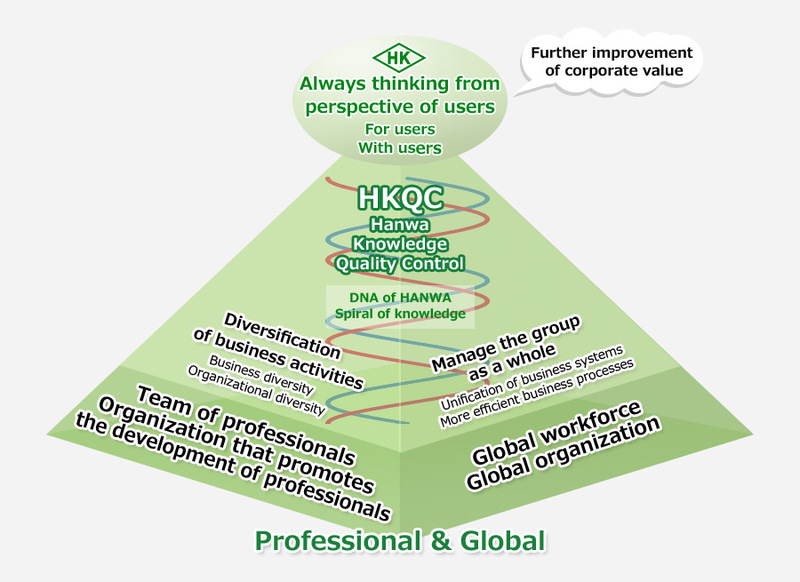 We will use HKQC (Hanwa Knowledge Quality Control) to improve business processes. By using these processes, we plan to conduct group business operations that further diversify our activities, facilitate unified group management and increase corporate value. Our aim is maximizing earnings by capitalizing on all profit opportunities across the entire value chain. This will require higher efficiency and optimization at every stage of the value chain, from manufacturers and suppliers to users. To accomplish this, Hanwa willimplement assertive strategies centered on self-sustained growth and the diversification of business activities. Considering growth of our business operations as well as increasing number of group companies in mind, it is necessary to improve our corporate structure capable of allocating head office resources efficiently and effectively. There will be a relentless pursuit of efficiency while achieving the proper balance between respect for the independence of group companies and regions, based on their respective characteristics, and a integrated management system that prevent profit leakage. Responding to environmental, social and governance issues, we aim to enhance our long-term sustainability and increase our corporate value with untiring awareness of where our social positions should be. Copyright (C) HANWA Co., Ltd. All rights reserved.